文献タイトル：The Natural Course of Unruptured Cerebral Aneurysms in a Japanese Cohort. The natural history of unruptured cerebral aneurysms has not been clearly defined. From January 2001 through April 2004, we enrolled patients with newly identified, unruptured cerebral aneurysms in Japan. Information on the rupture of aneurysms, deaths, and the results of periodic follow-up examinations were recorded. We included 5720 patients 20 years of age or older (mean age, 62.5 years; 68% women) who had saccular aneurysms that were 3 mm or more in the largest dimension and who initially presented with no more than a slight disability. Of the 6697 aneurysms studied, 91% were discovered incidentally. Most aneurysms were in the middle cerebral arteries (36%) and the internal carotid arteries (34%). The mean (±SD) size of the aneurysms was 5.7±3.6 mm. During a follow-up period that included 11,660 aneurysm-years, ruptures were documented in 111 patients, with an annual rate of rupture of 0.95% (95% confidence interval [CI], 0.79 to 1.15). The risk of rupture increased with increasing size of the aneurysm. With aneurysms that were 3 to 4 mm in size as the reference, the hazard ratios for size categories were as follows: 5 to 6 mm, 1.13 (95% CI, 0.58 to 2.22); 7 to 9 mm, 3.35 (95% CI, 1.87 to 6.00); 10 to 24 mm, 9.09 (95% CI, 5.25 to 15.74); and 25 mm or larger, 76.26 (95% CI, 32.76 to 177.54). As compared with aneurysms in the middle cerebral arteries, those in the posterior and anterior communicating arteries were more likely to rupture (hazard ratio, 1.90 [95% CI, 1.12 to 3.21] and 2.02 [95% CI, 1.13 to 3.58], respectively). Aneurysms with a daughter sac (an irregular protrusion of the wall of the aneurysm) were also more likely to rupture (hazard ratio, 1.63; 95% CI, 1.08 to 2.48). This study showed that the natural course of unruptured cerebral aneurysms varies according to the size, location, and shape of the aneurysm. 発行年： 2012; 367 : 40 – 9. 著者名：JC. Crosson, PA. Ohman-Strickland, D J. Cohen, EC. Clark, and BF. Crabtree. 文献タイトル：Typical Electronic Health Record Use in Primary Care Practices and the Quality of Diabetes Care. We implemented Secom’s EHR system into our 6 clinics these 4 years. But we could not always make use of its potential function as central portal system of medical information to improve our quality of care in daily practice. So, I am interested in this type of research to change our usage style of EHR. How can we find better use of EHR? Recent efforts to encourage meaningful use of electronic health records (EHRs) assume that widespread adoption will improve the quality of ambulatory care, especially for complex clinical conditions such as diabetes. Cross-sectional studies of typical uses of commercially available ambulatory EHRs provide conflicting evidence for an association between EHR use and improved care, and effects of longer-term EHR use in community-based primary care settings on the quality of care are not well understood. 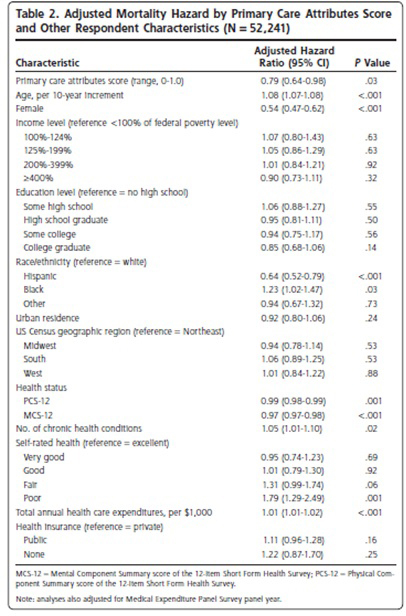 We analyzed data from 16 EHR-using and 26 non-EHR-using practices in 2 northeastern states participating in a group-randomized quality improvement trial. Measures of care were assessed for 798 patients with diabetes. We used hierarchical linear models to examine the relationship between EHR use and adherence to evidence-based diabetes care guidelines, and hierarchical logistic models to compare rates of improvement over 3 years. EHR use was not associated with better adherence to care guidelines or a more rapid improvement in adherence. In fact, patients in practices that did not use an EHR were more likely than those in practices that used an EHR to meet all of 3 intermediate outcomes targets for hemoglobin A1c, low-density lipoprotein cholesterol, and blood pressure at the 2-year follow-up (odds ratio = 1.67; 95% CI, 1.12-2.51). 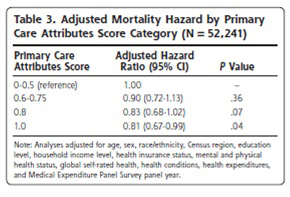 Although the quality of care improved across all practices, rates of improvement did not differ between the 2 groups. Consistent use of an EHR over 3 years does not ensure successful use for improving the quality of diabetes care. Ongoing efforts to encourage adoption and meaningful use of EHRs in primary care should focus on ensuring that use succeeds in improving care. These efforts will need to include provision of assistance to longer-term EHR users. 著者名：Dean A. Seehusen et al. 文献タイトル：Statins for Primary Cardiovascular Prevention: Cochrane for Clinicians Putting Evidence to Practice. 文献タイトル：Association of a difference in systolic blood pressure between arms with vascular disease and mortality: a systematic review and meta-analysis. To determine whether the use of age adapted D-dimer cut-off values can be translated to primary care patients who are suspected of deep vein thrombosis. Retrospective, cross sectional diagnostic study. 110 primary care doctors affiliated with three hospitals in the Netherlands. Participants 1374 consecutive patients (936 (68.1%) aged >50 years) with clinically suspected deep vein thrombosis. Proportion of patients with D-dimer values below two proposed age adapted cut-off levels (age in years×10 μg/L in patients aged >50 years, or 750 μg/L in patients aged ?60 years), in whom deep vein thrombosis could be excluded; and the number of false negative results. Using the Wells score, 647 patients had an unlikely clinical probability of deep vein thrombosis. In these patients (at all ages), deep vein thrombosis could be excluded in 309 (47.8%) using the age dependent cut-off value compared with 272 (42.0%) using the conventional cut-off value of 500 μg/L (increase 5.7%, 95% confidence interval 4.1% to 7.8%). This exclusion rate resulted in 0.5% and 0.3% false negative cases, respectively (increase 0.2%, 0.004% to 8.6%).The increase in exclusion rate by using the age dependent cut-off value was highest in the oldest patients. In patients older than 80 years, deep vein thrombosis could be safely excluded in 22 (35.5%) patients using the age dependent cut-off value compared with 13 (21.0%) using the conventional cut-off value (increase 14.5%, 6.8% to 25.8%). Compared with the age dependent cut-off value, the cut-off value of 750 μg/L had a similar exclusion rate (307 (47.4%) patients) and false negative rate (0.3%). Combined with a low clinical probability of deep vein thrombosis, use of the age dependent D-dimer cut-off value for patients older than 50 years or the cut-off value of 750 μg/L for patients aged 60 years and older resulted in a considerable increase in the proportion of patients in primary care in whom deep vein thrombosis could be safely excluded, compared with the conventional cut-off value of 500 μg/L.